Pvt. Antwan Williams, an Infantryman serving as a Human Research Volunteer Soldier at the U.S. Army Natick Soldier Research, Development and Engineering Center, models a prototype uniform developed by NSRDEC’s textile technologists. He is also wearing a MOLLE Medium Pack System and a conceptual load carriage vest system called the Airborne Tactical Assault Panel that is designed specifically for Airborne operations but will also be evaluated for non-Airborne operations, including jungle environments. 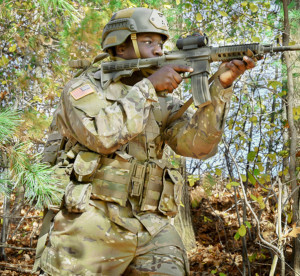 The Army has developed a fabric composed of 50 percent wool, 42 percent Nomex, 5 percent Kevlar and 3 percent P140 antistatic fiber. The goal is to create a flame-resistant combat uniform made wholly from domestic materials, said Carole Winterhalter, a textile technologist with the Army Natick Soldier Research, Development and Engineering Center. “We have a lightweight fabric that is inherently flame resistant. No topical treatments are added to provide [flame resistance],” Winterhalter said. “We are introducing a very environmentally friendly and sustainable fiber to the combat uniform system. To test prototype uniforms made with the fabric, three Army researchers traveled to Germany in August for Exercise Combined Resolve VII, where they worked with about 100 Soldiers. 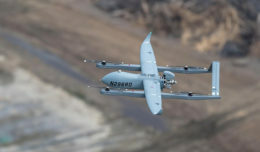 The exercise drew about 3,500 participants from NATO allies to the region. There, the researchers joined John Riedener, the field assistance in science and technology advisor assigned to 7th Army Training Command. 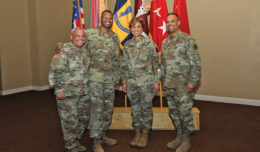 FAST advisors are a component of the U.S. Army Research, Development and Engineering Command. Soldiers from 1st Armored Brigade Combat Team, 3rd Infantry Division participated in the 21-day testing and completed surveys before and after the exercise, said Brian Scott, NSRDEC equipment specialist, Soldier and Squad Optimization and Integration Team. The R&D team selected Hohenfels, Germany, because the evaluation of a fire-resistant wool undergarment also took place there. During testing, each Soldier received three prototype uniforms. Each was made from the same wool-based blend. One was “garment treated” with permethrin, an insecticide, and another was “fabric treated” with permethrin. The third was untreated. The Soldiers, who came from a variety of military occupational specialties, wore each of the three uniforms for about seven days in a field environment for a total of 21 days. The testing and survey instructions asked Soldiers not to compare the prototypes with existing uniforms or camouflage patterns. Their feedback regarding comfort, durability, laundering and shrinkage, insect resistance, and overall performance will help determine whether researchers will continue the development effort, Winterhalter said. 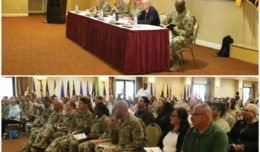 Initial results suggest the majority of the Soldiers liked the fabric because it was lightweight and breathable; however, analysis of the survey data has yet to be completed, said Shalli Sherman, NSRDEC program manager for the Office of Synchronization and Integration. Winterhalter is optimistic about the prospect of a wool blend being incorporated into combat uniforms because of its environmental, manufacturing and economic benefits. She said the United States has about 80,000 wool growers, and the Army would like to include the material in the clothing system. “Wool is 100 percent biodegradable. It’s easy to dye and absorbs moisture,” said Winterhalter, who also serves as the federal government’s chief technology officer for the Advanced Functional Fabrics of America Manufacturing Innovation Institute. The new Super Wash process makes wool viable for combat clothing in nearly any application, including jackets, pants, underwear, headwear, gloves and socks, Winterhalter said. NSRDEC researchers are planning for a larger field study with more users over a longer time period of time, possibly 30 days. More data on comfort and durability will be needed for the Army to move forward, Winterhalter said.